iOs 4.2 came to iPhone , iPad and iPod touch users just a days ago and from its many amazing new features , AirPlay was one the most internet new feature.AirPlay provides the solution for streaming video, audio, and photos from portable iOS devices to the new Apple TV for display on users’ televisions.Well it still has some limitation as streaming from third-party applications and even Safari limited to audio-only is not currently available in it. f-concept implementation, mainstream users would obviously prefer Apple to offer full-fledged support for the feature on third-party apps through public API developers could use for their apps. So , one Apple fan emailed Steve Jobs asking about the future of AirPlay and as we know that Jobs only replies important question so he replied this email. 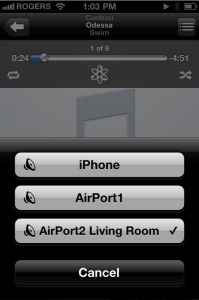 So , in future we can expects AirPlay features with the 3rd party apps which would definatly be a great news. Is Geohot's new jailbreak called Rubrya1n? may be. Smaller iPhone with no onboard Storage, Relying on Cloud-Based Content?